President Yoweri Museveni has been sucked into an on-going internet deal war between his cabinet ministers and some government agencies. In a January 8, 2018 letter, Museveni ordered all government ministries and agencies to henceforth procure all their internet services from the highly indebted Uganda Telecom (UTL). The letter is copied to the vice president, minister of Finance, minister of state for Privatisation and Investment, minister of ICT, minister of state for Industry and the attorney general. Museveni says the UTL liability "situation is not as bad" as has been portrayed by "corrupt officials that had been sucking the company, paying themselves huge salaries." According to the president, there are efforts and a well-calculated scheme to devalue UTL so as to sell off the company's assets. A recent probe by the parliamentary committee on Information and Communication Technology (ICT) discovered that UTL is indebted to a tune of Shs 698 billion as of December 2016. This includes, Shs 88.5 billion owed to Uganda Revenue Authority (URA), Shs 27.8 billion owed to Uganda Communications Commission (UCC) and Shs 10.6 billion owed to National Social Security Fund (NSSF) in form of unremitted workers' money, accumulated interests and penalties. However, Museveni in his letter says "all debt owed to government department and agencies should be converted into shares held by UDC on behalf of government." Ever since the ousting of Libyan strongman Muammar Gaddafi in 2011, UTL has been facing economic turmoil. Libya's state-owned UCom, held 69 per cent of the shares in UTL - with the Uganda government owning the remaining 31 per cent. In March 2017, Uganda government took over full ownership of the company. 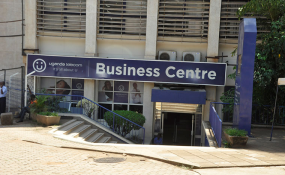 According to parliamentary committee on ICT, UTL even under-reported the money owed to NSSF. The MPs claim the liability is as high as SHs 18.3 billion as of March 2017 and not Shs 10.6 billion as reported by UTL management. However the president has a different view. "The situation of the company is not that bad. The company has a lot of assets including a shareholding of 9.13%in the West Indian Ocean Sub-Marine Cable. They also have infrastructure to transmit and store electronic data. Therefore, I direct that there should be no more sales of assets of the company. Instead, I fully accept Hon. [state minister of Finance for Privatization and Investment Evelyn] Anite's proposal and direct as follows... " Museveni wrote. "... As far as far as internet services are concerned, all government agencies and departments are directed to only use the channel in which UTL has shares", ordered. Adding; "UTL should be encouraged to partner with the Chinese company that wants to make mobile phones here; they also can be encouraged to use the local minerals such as Coltan, which I understand are crucial for making telephones... UTL network should be revamped and used to restore data." Compulsory purchase of UTL services was first mooted by Anite in June 2017, when, while officiating at the UTL staff blood donation drive at the Constitutional Square, she said that it would become compulsory for all Ugandans to own a UTL sim-card, the same way nationals own national IDs. "It is going to be compulsory for Ugandans to hold a UTL line just as it is for you to have a national ID, you must have a Ugandan line. That is the spirit of patriotism", she said then. According to parliamentary committee on ICT report, there were efforts to convert UTL's debts into equity pari-passu as a measure to balance sheet UTL, which "was gravely erroneous." Meanwhile, Museveni's directive to order government ministries to purchase internet services from UTL has not gone well with National Information Technology Authority of Uganda (NITA-U), the body currently providing internet to 322 government entities. Recently, NITA-U was accused by an Internal Security Organisation (ISO) whistle blower of inflating its procurement and sale with the aim of fleecing taxpayers. NITA-U denied the accusations saying it is a scheme to portray the agency in bad light. On ditching them for UTL on providing internet to government, NITA-U officials are questioning the capacity of UTL to provide internet services to government ministries, arguing that "all core equipment of UTL has reached end of life - meaning UTL does not have maintenance or support contracts for its core network". NITA-U also claims that currently, UTL is still on 2G network and would need to upgrade to 3G/4G network which would require more than $100 million of taxpayers money. In October 11, 2017, the permanent sectary/secretary to treasury Keith Muhakanizi wrote to the solicitor general (SG) Henry Obbo seeking legal interpretation on why his earlier directive to government ministries to purchase internet services from UTL had been ignored. In response to Muhakanizi, Obbo on October 26, wrote that the NITA Act provides that NITA-U is the mandated body to provide internet services to government and e-government regulations. According to Obbo, a directive to purchase Internet services would be in violation of the role of ministry of ICT under which NITA-U falls, the lead ministry mandated to implement ICT interventions in Uganda including providing the infrastructure for government data, internet and voice services. "Furthermore", the SG wrote "rationalization of the ICT services under ICT ministry was based on the decision of cabinet on ICT services utilisation under cabinet minute no. 261(CT2012). "It is our opinion that the implementation of the directive does not pass the test of NITA Act, regulations and cabinet decision of 2012 that led to the designation of Ministry of ICT through NITA-U as the primary agency in provision of internet services to government."